After four BJP leaders allegedly thrashed a local journalist Saturday, journalists in Raipur want a law to protect them. New Delhi: Journalists in Raipur have found a unique way to protest against Bharatiya Janata Party (BJP)’s district chief Rajeev Agarwal, who was arrested last Saturday along with three other party workers for allegedly thrashing a local journalist named Suman Pandey. 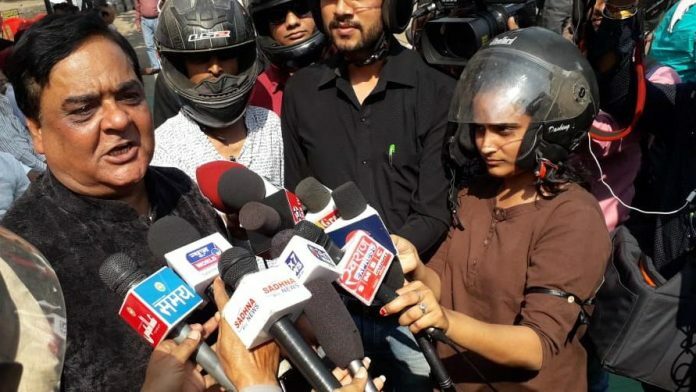 On Wednesday, journalists in the city started interacting with BJP leaders wearing a helmet as a form of protest against the incident, said Raipur Press Club president Damu Amedare. “Whether it’s an event, press conference, meeting, or even taking a sound byte, we won’t stand for a threat to our safety,” Amedare told ThePrint. Amedare said at least 500-600 city reporters are protesting the incident by wearing helmets and conducting bike rallies. A bike rally was also organised Tuesday, where slogans were shouted in front of the BJP’s office. 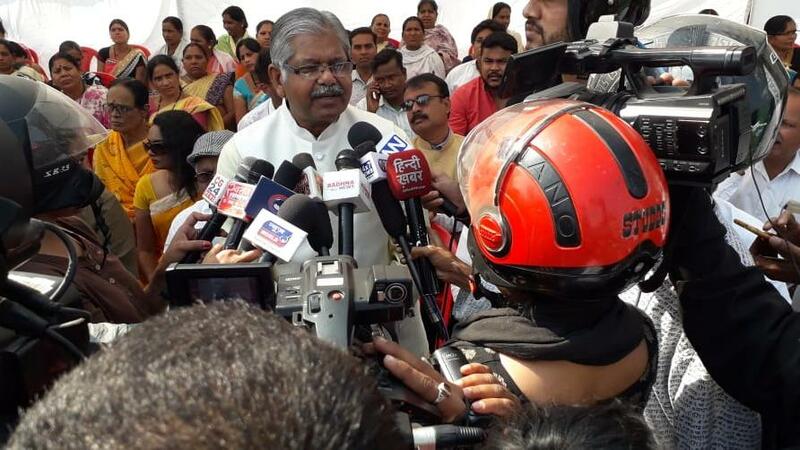 Local journalists in Raipur have two demands from the BJP: The removal of Agarwal from the party, and a new law for the protection of journalists, as was being considered by Chhattisgarh chief minister Bhupesh Baghel, to be brought in the Vidhan Sabha in the upcoming session of the state assembly. In reference to the incident Saturday at the party’s divisional office, BJP state office in-charge Subhash Rao said media persons were asked to leave after taking photos and interactions, but Pandey stayed back and began “spying on the proceedings of the BJP meeting by video recording so party members threw him out”. “The media is the media, they’ll take out protests and sensationalise what happened. The BJP has done everything from their side, we’ve folded our hands and apologised also, what more can we do?” asked Rao. On Saturday, Pandey, along with a number of other journalists, was present at the BJP divisional office to cover an internal review meeting of the party’s loss in the recent state polls. An altercation ensued among the party leaders, and Pandey attempted to record the incident on his phone. “They (BJP leaders) tried to stop him, and said that when they asked for an ID card, either he didn’t show it or he didn’t have one,” Sanjeev Gupta, a senior reporter with news agency PTI, told ThePrint. “They tried to take his phone and delete the video, and in the middle of all this, they manhandled him and slapped him a few times,” added Gupta. According to statements made by Pandey to the press, he was then made to wait for 20 minutes inside the meeting room, after which he was released. Pandey identified the other three accused in the assault as local BJP office-bearers Vijay Vyas, Utkarsh Trivedi and Deena Dongre. An FIR against the four was lodged in the local police station and they were reportedly booked under section 342 (wrongful confinement), 323 (voluntarily causing hurt), 504 (criminal intimidation) and 34 (common intention) of the Indian Penal Code. However, they got bail the same evening. Journalists protested outside the office all night Saturday, after which Amedare said that BJP’s Chhattisgarh unit chief and leader of opposition in the assembly Dharamlal Kaushik and former minister Brijmohan Agrawal arrived at the scene to initiate dialogue. “No resolution was reached. They kept denying that their party members did anything wrong. Even when we showed them a video, they wouldn’t listen,” said Amedare. This is something very new, there was no such feeling of insecurity in the journalists, as much they feel today…!